At just under 12? 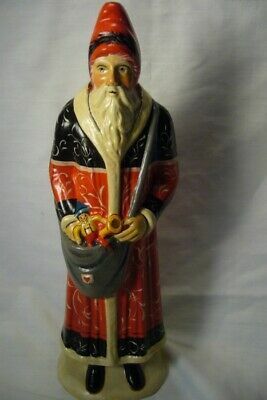 tall, this French inspired figure is seen with a sack of toys being delivered to the good children this St. Nicholas? Day. Unlike the historic tradition of St. Nicholas? assistant, this figure has opted to spread cheer, as indicated with the heart patch seen on the front of his sack. Vaillancourt Folk Art, Gnome Like Santa FC with Bag signed by Judi! VAILLANCOURT FOLK ART RED FATHER CHRISTMAS VILLAGE personally signed by Judi!